With optimised security, your factory can benefit from protection for buildings, materials, products and employees. Factories are often targeted by criminals – with raw materials such as copper and steel highly sought after. With security systems and remote monitoring in place, your factory’s security will be optimised, reducing the risk of theft and keeping your factory running efficiently. What is remote monitoring and how can it benefit factory security? Remote monitoring is when security systems installed at your site are monitored by an external central station (also know as an alarm receiving centre or remote monitoring station). Detectors installed at your factory identify unusual activity – perhaps someone in the factory after normal working hours or an individual breaking the perimeter of your site. Your CCTV cameras will start to capture footage, which is transmitted to the remote monitoring station. From there, staff at the remote monitoring station will act quickly to investigate the cause of the alarm, studying the CCTV footage. If the security team identifies suspicious activity they will immediately call the relevant parties, including the emergency services if required. Access control: With remote monitoring in place, your access control systems will be managed by a team of security experts based in an alarm receiving centre – when an individual requests access to your site, the security experts can visually or verbally confirm the identity of the individual, and then permit or deny access. 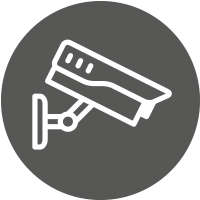 CCTV monitoring: With remote CCTV monitoring, unusual activity won’t go unnoticed – if an intruder enters your site, an audio announcement will be made to warn them away from the site and the emergency services will be called if required. Video analytics: The latest in security innovation, video analytics can help improve business efficiency and security. Smart video software integrated with your CCTV cameras can help you to analyse the productivity of your factory by monitoring input, output, footfall, systems and more. The intelligent video analytics will interpret activity, which is also useful for detecting health and safety or security issues. By choosing remote monitoring you’ll have peace of mind knowing security experts are watching your factory when you need it most – whether that’s 24/7, 365 days a year or just over night when your on-site security team go home. With Farsight Security Services providing your remote monitoring you’ll also benefit from an industry leader in this specialist field. Find out more about the standards we set here. Get in touch with Farsight Security Services today to find out how your factory security could be improved. Call us on 0845 371 0101 or send us an email. Get in touch with us today to find out how Farsight Security Services could improve your factory’s security. Phone us on 0845 371 0101 or send us an email.